Pocket square purveyors Rampley & Co are the masterminds behind putting masterpieces on squares of silk. 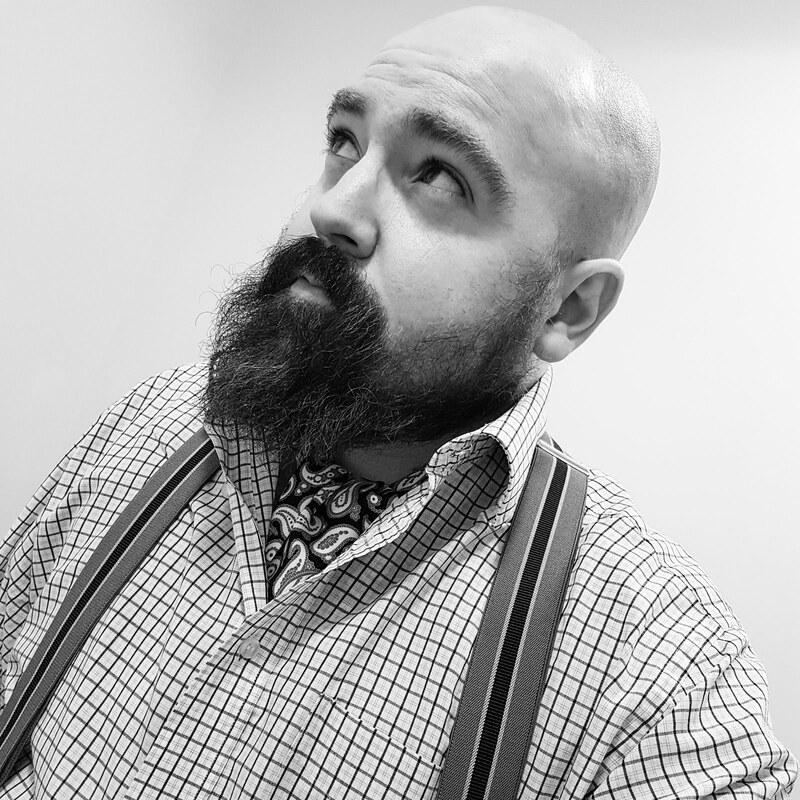 100% silk, hand rolled edges and designed and printed right here in good old Blighty, my Pompeii pocket square is part of their Fine Art collection. The collection also includes the ‘Battle of Trafalgar, as Seen from the Mizen Starboard Shrouds of the Victory’ and ‘The Death of Major Peirson’. Rampley & Co have also recently launched an impressive National Gallery collection. Other collections include Harris Tweed, Waterloo 200th and a particular favourite, William Swainson. 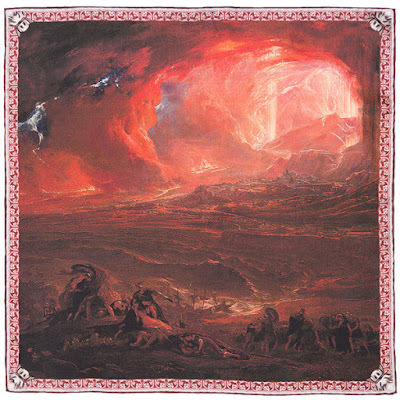 I am absolutely tickled pink with my Pompeii pocket square. It arrived exquisitely presented in a black box, with the Rampley & Co insignia emblazoned across it. It also came with a rather lovely card and an unexpected treat - a pair of collar stiffeners. It’s added touches like the collar stiffeners that really do make a difference. This is undoubtedly a quality product. The Pompeii pocket square, which measures 42cm by 42cm, costs £69 which is pricey for a piece of silk. But then, you do get to walk around with an apocalyptic scene of an erupting volcano protruding from your pocket. This is also proudly made in Britain, with the silk printed in Macclesfield. 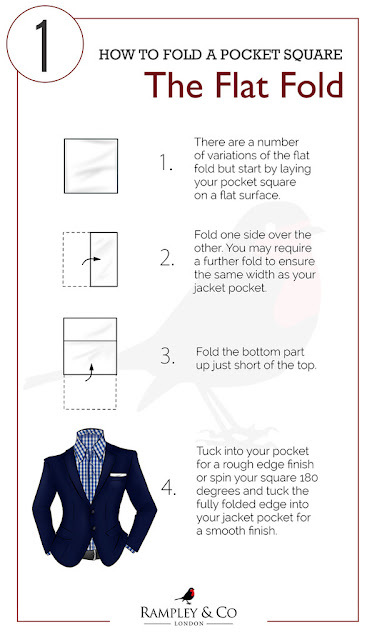 Rampley & Co helpfully have folding guides on their website so I had a little fun practicing a few folds. With a pocket square of this beauty, it deserves a little thought rather than casually stuffing it in one’s jacket pocket. The first is a simple one - the Flat Fold. A classic fold, this merely hints at the fine art hiding away. 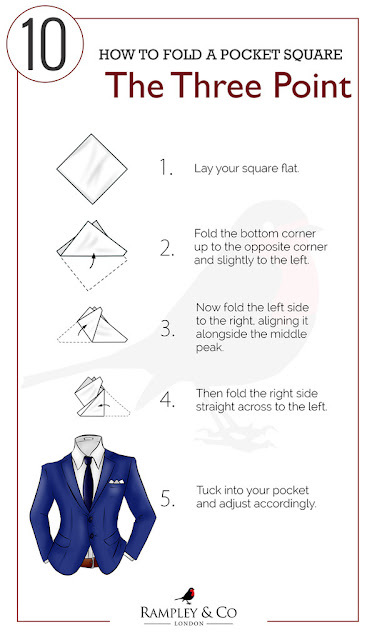 The Pompeii pocket square looks particularly super when paired with a navy blue jacket. The second fold I tried is The Dunaway. Rather than sport four points though, I opted for three. I'm awkward like that. An intricate fold, this is my favourite. What starts to become clear is that an elaborate design really gives you options for different looks. The Double Point Roll was next up. Quite similar to The Dunaway with the roll, it reminds me of a Devil's horns. Which I must admit to quite liking. Finally, I attempted The Three Point fold. The Three Point Fold proved a little tricky. It was simple enough to fold, but I came a little unstuck when attempting to stuff it inside my pocket. Practice makes perfect though! This is the pocket square in all it's volcanic glory. Isn't she spectacular? I have no hesitation in recommending Rampley & Co. Elliott Rampley, the founder, is lovely chap and all round good egg. He obviously strives for quality and he achieves this in abundance. Chapeau, Rampley & Co, chapeau!